At the start of Dylan Allen’s short film “Epilogue,” an Indiana Jones-like action hero named Skillman (played by Chris Henry Coffey) walks past the line of corpses he’s left littered around a mountain stronghold, finds his love interest Veronica (Lucy Walters), and locates the last glowing orb he needs to complete his quest. Mission accomplished. Big kiss. And cut to…. Skillman and Veronica, awkwardly standing outside the villain’s lair, trying to figure out where they left their weapons and where they parked. 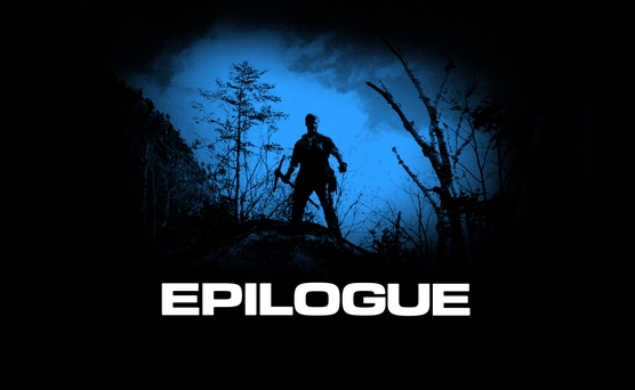 “Epilogue”’s production values are high, with Allen and his cinematographer/editor Evan Jake Cohen making great use of rural New Hampshire to stand in for both a supervillain’s lair and the mundane world to which Skillman and Veronica return. Also great: the retro 1980s score by occasional Dissolve contributor Sam Smith (who also designed the short’s poster). But “Epilogue”’s biggest assets are the performances of Coffey and Walters—who give the film’s serious and silly material equal nuance—and the premise itself. The idea of “Epilogue” is so intriguing that it’s a little disappointing when the short ends. It’s not just that there’s more Allen could’ve done with this story, but that Skillman’s world is so vividly drawn that the “what happens next?” factor is strong—even if all that happens next is that Skillman tries to cobble together enough cash to buy a bus ticket. Previous “Short Cuts” columns can be found here.